The book focuses on technology practicability, and all the technologies introduced, have been partly or fully applied. 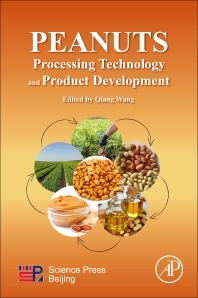 It is a valuable book and important reference for technicians and R and D persons in the peanut processing industry, and can also be used as a reference book for professional teaching and scientific research in the field of food science and engineering. Students majoring in food science and engineering; researchers and scientists in grain and oil processing; technicians in peanut process industries. Prof. Wang has carried out research in the field of peanut science and technology over 10 years. His research covers almost all fields of peanut processing and product development. He has presided over more than 20 national projects including National Science and Technology Major Project, Special Fund for Agro-scientific Research in the Public Interest, National Natural Science Foundation of China, Key Program for International S&T Cooperation Projects of China, etc. He was awarded the prestigious Harald Perten Prize (the highest achievement award of the International Association for Cereal Science and Technology) in 2012 and became the first Chinese awardee of this international prize. As the first contributor, he was awarded the second prize of the National Award for Technological Invention. He obtained 17 authorized national patents; developed 6 agricultural industry standards of China; edited 9 books; published more than 150 articles.